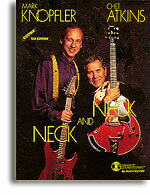 From their smash CD Neck & Neck, each and every lick has been captured in both Music and TAB. Ace transcriber Allen Slutsky paints a crystal clear picture of Chet Atkins' & Mark Knopfler's exciting fingerstyle and lead playing. (Thanks also to Atkins authority John Knowles, who fine-tuned many of Chet's trademark licks.) There's plenty to learn here - these are two 6-string giants, and they've collaborated to create some of the finest guitar work on record. And since great music is more creativity and taste than simply high-speed licks, we're happy to report that all levels of players will benefit from this greet folio. Very highly recommended! Music & TAB, 10 solos.